Exploring remote areas of the world, particularly the Polar Regions, means that a robust hull is an essential starting point. Steel is the most popular material, with ice class being a common yardstick for measuring strength. In January 2017, the International Polar Code came into effect raising the bar higher still, and the Damen SeaXplorer 65 (pictured) is one of a handful of vessels currently being built to this standard. 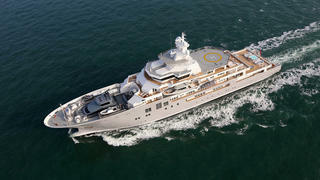 The rise of explorer yachts has seen many projects specified with far more crew space. Specialist crewmembers are often needed for long-range expeditions, such as local guides, helicopter pilots, ski instructors or even documentary videographers. 126 metre Octopus, widely regarded to be the world’s largest explorer yacht, is a fine example of this, with room for a colossal crew of up to 50 people. 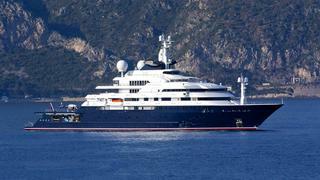 The rise of explorer yachts has seen many projects specified with far more crew space. Specialist crewmembers are often needed for long-range expeditions, such as local guides, helicopter pilots, ski instructors or even documentary videographers. 126 metre Octopus, widely regarded to be the world’s largest explorer yacht, is a fine example of this, with room for a colossal crew of up to 50 people. When exploring varied and unpredictable cruising grounds, it is a good idea to have a whole arsenal of tenders and toys at your disposal. As Captain Stan Antrim puts it: "What matters is what you hang on to them — the seaplanes, the helicopters, the sportfish yachts — the whole gamut. 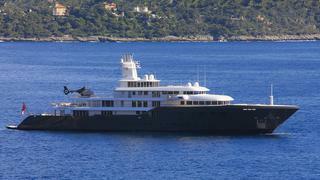 Even though you can do the exploring on 40 metre yacht and be happy, you can’t take all of that stuff with you.” The 107.4 metre Ulysses excels in this regard, with six motorbikes, two ATVs, a landing craft, and an amphibious tender in its garage, not to mention a 21-metre, 50-knot catamaran support boat that can be hoisted off the foredeck by a pair of custom-designed cranes. The 107.4 metre Ulysses excels in this regard, with six motorbikes, two ATVs, a landing craft, and an amphibious tender in its garage, not to mention a 21-metre, 50-knot catamaran support boat that can be hoisted off the foredeck by a pair of custom-designed cranes. Whilst the definition of a superyacht is longer than 24 metres, some would argue that explorer yachts should be at least 40 metres long to carry all the necessary equipment. However, there are exceptions to the rule, with Cantiere Delle Marche proving highly successful in building compact, yet long-range explorer yachts. The Italian yard’s fleet ranges from 25 metres up to the 33.4 metre Narvalo, which has been designed to cruise with the narwhals that she was named after. Another common measurement for whether a yacht is a true explorer or not comes with its maximum cruising range — how far can it explore without needing to refuel? Most yachts measuring over 40 metres will have a transatlantic cruising range of around 3,000 nautical miles, but serious explorer yachts will have an even longer range. 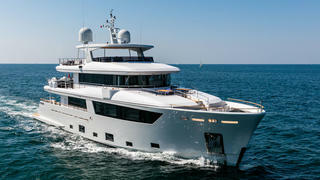 Andrea Pezzini, founder of charter management and brokerage firm Floating Life, argues: “For us, the minimum range for a yacht to be considered a true explorer yacht is 5,400 nautical miles and a speed for long distances of no less than 10 to 12 knots.” The 90 metre Lürssen yacht Ice easily satisfies this criteria, as she can cruise for 6,000 nautical miles at 15 knots without having to fill up. Deep storage, emissions control and a high degree of manoeuvrability are just some of the other important considerations when defining an explorer yacht. An in-depth analysis of all these factors and much more can be found in Futureyachts, which is out now. Another common measurement for whether a yacht is a true explorer or not comes with its maximum cruising range — how far can it explore without needing to refuel? Most yachts measuring over 40 metres will have a transatlantic cruising range of around 3,000 nautical miles, but serious explorer yachts will have an even longer range. The 90 metre Lürssen yacht Ice easily satisfies this criteria, as she can cruise for 6,000 nautical miles at 15 knots without having to fill up. Deep storage, emissions control and a high degree of manoeuvrability are just some of the other important considerations when defining an explorer yacht. An in-depth analysis of all these factors and much more can be found in Futureyachts, which is out now.